With a stylish Aztec style stripe down the sleeve seams, this luxuriously soft knit black Elena Miro tunic is a real must have piece. We love the dipped hem. 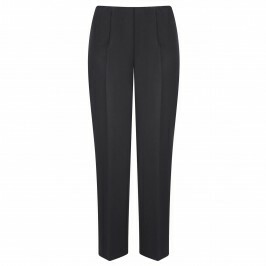 Team with tailored black trousers and heels for a polished monochrome look. Tunic with Aztec style stripe on sleeves. 80% Viscose, 20% Polyamide. Fabric 2: 100% Cotton. Hand Wash or Dry Clean.